Recognized as one of the Top Acting Teachers and Coaches in the business. 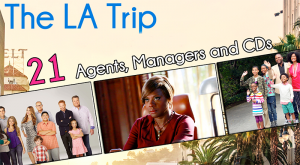 Fantastic opportunity to work in Los Angeles with 21 Agents, Managers, and Casting Directors…plus so much more! Amazing 3 week Intensive to work with top tier 22 Casting Directors, Agents and Managers …plus personal coaching! Exclusive for recent grads to work with over 28 of NYC’s best Agents, Managers, Film Directors and Casting Directors! After meeting Blake Lowell of Ingber & Associates at the Commercial Agent Panel, Marcin was called in to discuss representation! After meeting in class, Allison Kirschner brought Ted in to audition for a role in THE DETOUR and he BOOKED IT! After attending a session with Traci Turton of 90210 Talent, Rachel was brought in to discuss representation and she was SIGNED! After meeting Kim Miscia at One On One, Alex was called into her office to audition for GOTHAM!